That would be the Frye Paige Huarache flat boot (in cement). I have a weird history with Frye boots. Especially grey ones. Last November (of 2008, that is), I was walking around New York's Upper West Side with my best friend from work. It was the night of Election Day and all of the city seemed to be in an exuberant mood. We were on our way to an election party. As it happens, we went to an Urban Outfitter and as I was rifling through overpriced merchandise, when I saw one of the most beautiful pairs of boots I'd ever seen. They were not the boots shown above. 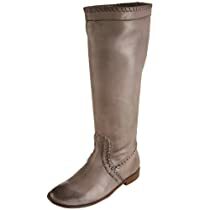 They were the Frye Paige Cuff boots in grey. They were also about $400. I decided that they were unnecessary, despite my love of boots (as evidenced by my blog title) and their perfect grey color. I have regretted this bitterly for over a year. Since then, I've purchased another pair of Frye boots, the Veronica Slouch in sapphire (yes, I own bright blue boots). I was even sadder about my missed opportunity now that I knew how much I indeed loved Fryes. A couple of weeks ago, I even called the Frye company to ask if the Paige Cuff boots were even in stock anymore ANYWHERE. They're not. I consoled myself. I already own two pairs of grey boots (one tall, suede, one short, grey bootie). Anyway, the Huaraches had been my #2 choice. I "conveniently" had forgotten about them on my mad crusade for the Paige Cuffs. But then this morning I found them on sale. Long story short (...too late), I ordered them off the internet. They're coming tomorrow. I can't wait. Have I mentioned that I work at an extremely conservative school where I'm not allowed to wear boots? "We watched a video about our changing bodies."